In this project, students will work with their family to disguise a turkey to prevent it from getting eaten for Thanksgiving. Students will take a turkey body home (printed on cardstock) to disguise it with family members. Once it is brought back to school, students will write about the turkey and how it survived Thanksgiving! I've done this activity with my students for years, and the students and parents love it! It's so much fun seeing the disguises they come up with. 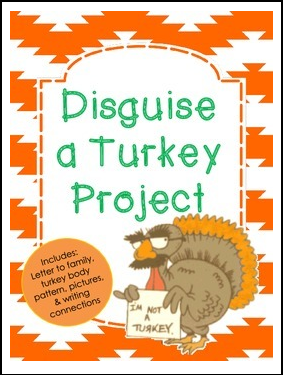 -Pictures of some of the turkey disguises my students have done in the past to give your students some ideas. Have a great time with this project and Happy Thanksgiving!